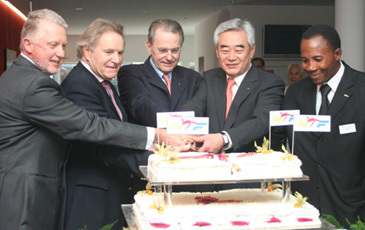 IOC President Jacques Rogge (center) joins WTF President Chungwon Choue, GAISF President Hein Verbruggen (1st from left), ASOIF President Denis Oswald (2nd from left) and Noutais Jacques (first from right), president of the Benin Taekwondo Federation, to cut a cake during an opening ceremony of a new WTF office at the MSI in Lausanne, Switzerland on May 5, 2009. As part of its ceaseless efforts to consolidate taekwondo's status as an Olympic sport and to take it beyond a mere sport, the World Taekwondo Federation has come up with several action programs to realize its "new vision." IOC President Jacques Rogge spoke well of the WTF's "exemplary collaboration with the IOC" and said that the WTF has "made a huge progress" since the 2000 Sydney Olympic Games. To attain its new vision, the WTF will strengthen the function and role of its office in Lausanne, Switzerland, which will ultimately serve as a global center of the WTF for international relations and Olympic coordination. The WTF will also expand its Solidarity programs for the disabled and less-privileged people and Taekwondo Peace Corps programs, as well as focus on youth education, thus helping taekwondo contribute to the promotion of world peace. WTF President Chungwon Choue made public the WTF's new vision action programs in his speech during a ceremony to mark the opening of a newly expanded WTF Lausanne office at the Maison du Sport International (MSI) in Lausanne on May 5, 2009. "Our new vision to reorganize the WTF into a dual structure is to bring taekwondo closer to the center of the Olympic Movement and to the international sports community," WTF President Choue said during the ceremony. He said, "Our Seoul office will concentrate on taekwondo development, technical issues and finance. Our Lausanne office will function to coordinate with the IOC, the WADA, international sports federations, and overall international sports organizations." The ceremony drew more than 70 high-ranking sports figures, including Dr. Jacques Rogge, president of the International Olympic Committee (IOC). Among other attendees at the ceremony were Mr. Denis Oswald, president of the Association of Summer Olympic International Federations (ASOIF); and Mr. Hein Verbruggen, president of the General Association of International Sports Federations (GAISF). Also at hand were IOC Sports Director Mr. Christophe Dubi; Mr. Kelly Fairweather, director of the World Anti-Doping Agency; ASOIF Executive Director Mr. Andrew Ryan; and IOC International Cooperation and Development Director Mr. T.A.G. Sithole. A dozen presidents of the WTF member national associations attended the ceremony. IOC President Rogge said in his congratulatory speech during the ceremony that "I am grateful of the initiatives of the WTF. I would like to thank the WTF for its exemplary collaboration with the IOC." "If I make a comparison with the 2000 Sydney Olympics, now the WTF has made a huge change. The sport of taekwondo has become more dynamic," IOC President Rogge said. The WTF officially opened its Lausanne liaison office on Dec. 1, 2006, with Mr. Jean-Marie Ayer, a special assistant to the WTF President, serving as the WTF attaché of the office. As part of its new vision programs, the WTF has recently decided to expand and move the Lausanne office at the MSI as the global center. WTF President Choue said in his speech, "Our WTF Lausanne office will cover extensive work related to international relations, communication, and cooperation, as well as globalization strategy of public relations and marketing." "Mr. Phil Coles, a WTF vice president and IOC member, will be based in our Lausanne office for two months, helping out the office to lay out the foundation in a desirable direction." IOC President Rogge, ASOIF President Oswald, GAISF President Verbruggen, joined WTF President Choue and Noutais Jacques, president of the Benin Taekwondo Federation, for a cake-cutting ceremony, followed by a series of demonstrations by members of the Swiss Taekwondo Federation, which drew much applause from the participants. In his opening speech, WTF President Choue said, "It has been some four years since we had a WTF Council meeting here in Lausanne in the presence of IOC President Rogge. There, we confirmed our commitment to improve our measures for the WTF to meet the global standards, and projected our resolution to realize the reform initiatives." At the WTF Council meeting at the IOC headquarters on March 10, 2005, the WTF unanimously approved a WTF Reform Report, which contained hundreds of recommendations for the improvement of the WTF. Since then, the WTF president said, the WTF has gone through a significant change for the better. The WTF membership has expanded from 179 to 188 countries and various new international competitions were introduced. In addition to enhancing taekwondo's role and value as a global sport, he said, the WTF has focused on making taekwondo competitions more exciting, transparent and fairer. "For excitement, we introduced media-friendly world athlete ranking system, with diverse events such as the World Taekwondo Poomsae Championships, Para-taekwondo Championships, and professional taekwondo competitions, etc.," Choue said. For fairer taekwondo competition, he continued, the WTF enhanced training of referees and coaches, introduced an instant video replay system, and has been working on perfecting the electronic protector system. Recently, under the vision of IOC President Rogge, the WTF strives to take taekwondo beyond a mere sport, and to contribute to world peace and education of the future generation, Choue said. "The WTF has launched the Taekwondo Peace Corps and expanded Solidarity programs for the disabled and less-privileged youth worldwide in order to provide taekwondo training programs and equipment to those who lack in resources and opportunities to learn and practice taekwondo," he said. "The WTF is also involved in some upcoming projects for youth, such as the World Taekwondo Youth Camp and the World Taekwondo Academy, The projects are to facilitate taekwondo in the Youth Olympic Games and to support the OVEP (Olympic Values Education System) of the IOC." WTF President Choue said, "It is my great pleasure to share with the Olympic family together with the taekwondo family of our new vision and commitment, especially on the occasion of the opening of celebrating the opening of our new Lausanne office." Expressing his gratitude to IOC President Dr. Jacques Rogge for his full support and encouragement for taekwondo's efforts for the betterment, WTF President Choue concluded by saying, "The reconfirmation of the WTF's goals signals our strong commitment in realizing our vision. We are fully open to your friendly advice and cooperation."